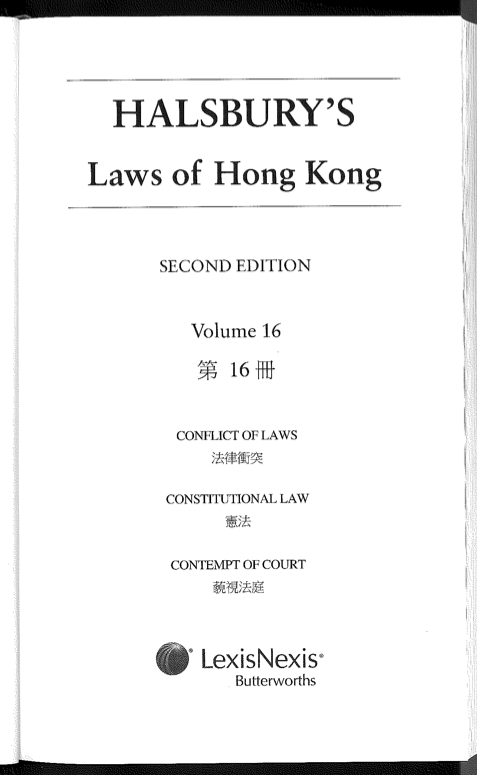 Congratulations to Mr Justice Kemal Bokhary (Honorary Professor) and Professor Johannes Chan who have re-written and updated the Constitutional Law chapter in volume 16 of Halsbury's Laws of Hong Kong, second edition (May 2015). The contributing editors to the chapter were Mr Danny Gittings (PhD candidate), Ms Alison Y.Y. Choy (BSocSc(Government & Laws), LLB & PCLL), and Mr Anson Wong Yu Yat (BBA (Law), LLB & PCLL). Dr. Keith Hotten is the author of the revised Contempt of Court chapter.